We’d love your help. 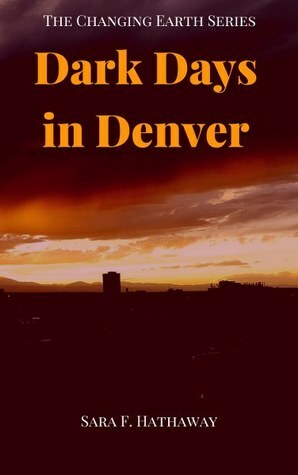 Let us know what’s wrong with this preview of Dark Days in Denver by Sara F. Hathaway. To ask other readers questions about Dark Days in Denver, please sign up. Hello, I'm Sara F. Hathaway. I'm the author of The Changing Earth Series. A collection of post apocalyptic fiction novels. I blend the concept of entertainment and education throughout all of my fictional works. As you experience the adventure you will be learning how to survive should you be faced with hard decisions. I furthered this concept with the creation of The Changing Earth Podcast that i Hello, I'm Sara F. Hathaway. I'm the author of The Changing Earth Series. A collection of post apocalyptic fiction novels. I blend the concept of entertainment and education throughout all of my fictional works. As you experience the adventure you will be learning how to survive should you be faced with hard decisions. I furthered this concept with the creation of The Changing Earth Podcast that is available on iTunes and Stitcher. I have been featured on Entrepreneurs on Fire, Survivalist Prepper, Today's Leading Women, Instinct Survivalist and many other podcasts, blogs, and newspapers! I encourage you to come by and see the full tour. Also as my gift to you I have a free guide to help you decide what would you take with you if you had to evacuate your home in less than five minutes. Go to http://www.authorsarafhathaway.com to claim your "Go-Bag" Essentials Guide. My areas of specialization are in business management, marketing, homesteading and disaster preparedness. and writing, I am at the gym strength training, tending to my garden and preserving the fruits of that labor. The focus of the first of my books, Day After Disaster is the apocalyptic survival adventure of a women on a mission to find her family, dead or alive. Book two, Without Land picks up nine years later with Erika trying to survive in a climate that is much different than the one she knew not so long ago. experience just how fragile our manufactured society is. As a fictional author, mother and wife, I believe that we must be prepared to adapt and survive if the earth were to drastically change. My books provide examples of survival attitudes, skills and scenarios to get you thinking: How would you survive?